West Ham defender Dan Potts has left hospital and returned home to rest after suffering suspected concussion in Wednesday's 5-1 defeat by Arsenal. Potts, 18, spent the night under observation after appearing to suffer a clash of heads and falling to the ground before being carried off. A statement on the West Ham website said tests carried out on the teenager had "come back positive". "I am looking to be feeling better over the next few days," said Potts. "A big thank you to everyone for their support and messages." Potts replaced midfielder Jack Collison in the 62nd minute and 10 minutes later he appeared to clash heads with Arsenal's Bacary Sagna before landing awkwardly. He was treated on the pitch for around 10 minutes before being taken from the field on a stretcher, in a neck brace, receiving gas and covered in an emergency blanket. "There will be a period of rest for Potts before he is allowed to start light work back in the gym," added the West Ham statement. "The club would also like to thank the London Ambulance Service, the on-site pitch rescue team and everyone at Arsenal who helped in making sure Potts was taken to hospital as quickly as possible. "The 18-year-old spent Wednesday evening in hospital and underwent further scans and tests which came back positively on Thursday." 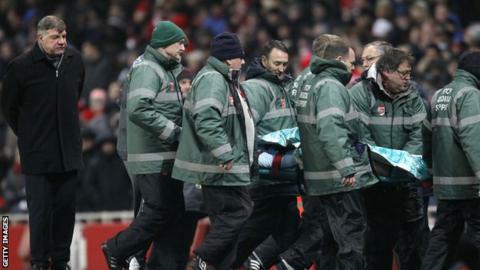 Manager Sam Allardyce had expressed his concern over Potts' injury after the games. "The clash of heads initially knocked him out and he hit the floor as a dead weight and I think that is what the problem was," added the fromer Newcastle, Blackburn and Bolton boss. "He hadn't spoken when he came off the field. He spoke about some things that they asked him on the pitch but they were not the correct answers so that is how we knew he was concussed. He was communicating but was obviously confused. "Hopefully it is just concussion. Because he lost consciousness it is a minimum of two weeks, I think, before he can play again." Potts came through West Ham's youth system before making his senior debut in December 2011 - a 1-0 victory against Barnsley. Earlier this season he had a spell on loan at Colchester, playing five games for the League One club. Potts is the son of former West Ham defender Steve, who made almost 400 appearances for the club between 1985 and 2002.